Description: We design and develop a large assortment of chain pulley block which is widely well reckoned for its long and excellent services. 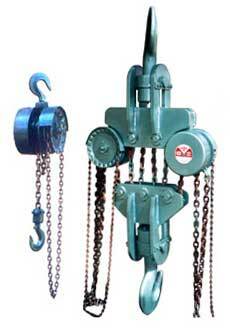 We have carved a niche as one of the predominant industrial chain pulley block exporters from India. We install the best quality screw & friction disk type brake in our motorized chain pulley block to ensure full safety at every position. Four pockets malleable iron cast load wheels are mounted on spur gear & ball bearings which assist in reducing the pull on chain. All the parts of the chain pulley block are corrosion and abrasion resistant.